Around 50,000 ESQ-1s were built between 1986 and 1988. It's hard to imagine today, but in 1986, analogue equipment was stale and passé, yet instruments based on digital synthesis were expensive or unfathomable. Yamaha's DX7 was nicely priced but difficult to program, and PPG's Wave 2.2 (and later 2.3) had caused something of a stir with its blend of digital wavetable oscillators and analogue filters, but was priced out of reach of all but wealthy professionals. The industry was primed for change, and there was indeed a whiff of something new in the air. Korg had unleashed the DW-8000 only a year earlier, merging sampled waveforms with a familiar subtractive signal path. That same year, Ensoniq - founded by ex-Commodore bigwigs - had begun shipping the Mirage, an 8-bit sampler based on their own custom chip technology, utterly shattering the price barrier and bringing sampling to tens of thousands of musicians for the then highly competitive sum of $1700. 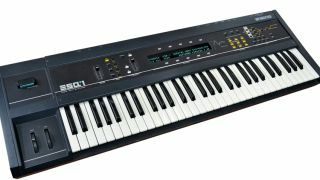 Yet the Mirage had not been the debut initially planned by Ensoniq. A savvy bunch, they fast-tracked the Mirage into production and side-lined the development of their intended first release when it became apparent that sampling was going to be 'the next big thing'. The instrument they'd temporarily held back was the ESQ-1. Like the Mirage, it was intended to provide heretofore unaffordable tech at a door-busting price. And that it did. Coming in at just over £1000, the ESQ-1 was, like the PPG and Korg instruments before it, a wavetable synthesiser. 32 onboard waveforms were provided in a wide range of flavours. There were typical analogue waveforms, some spicy digital tones, and a few looped, multisampled real-world instruments. These waves could be played by three oscillators, which in turn were shuttled through a classic 4-pole, resonant analogue filter based on the ever-popular Curtis chips of the day. Six-stage envelopes and three LFOs were on offer to shape sounds over time. And what sounds they were! Rich, bell-like tones, bright, ballsy brass and warm, gooey pads - this thing could do it all. If the constrained bit-depth of the samples limited the fidelity, the analogue back end more than made up for it. If that were the end of the story, you might now be reading about the aforementioned Korg. Yet the ESQ-1 had an ace up its sleeve (or rather, behind its glowing fluorescent display). You see, the eight-voice ESQ-1 was also multitimbral, able to assign each of those voices to a different sound on a separate MIDI channel. Better still, it came with a built-in eight-track sequencer, able to store 2400 notes (expandable to 10,000). 30 sequence patterns could be chained together to form songs. This was an unprecedented amount of power at this price point, and it made the ESQ-1 the first affordable 'workstation', long before the PR departments of bigger companies came up with the term. A thorough success, Ensoniq followed up with a "pro" version, the SQ-80, featuring more waveforms and a better keyboard. Eventually, the ESQ-1 would be overshadowed by dedicated workstations with built-in effects (one of the few things it lacked), but there was something delightful about those 8-bit waves and analogue filters, and even now, synthesists are beginning to realise the instrument's worth. It might be getting a little long in the tooth, but age has done nothing to tarnish this exquisite and meticulous reproduction of the mid-'80s Ensoniq synths. Specifically modelling the Ensoniq SQ-80, the Windows-only SQ8L also provides every sample and feature from the ESQ-1. It's a 1:1 copy, so users of the original will feel right at home with the interface. The only direct ESQ-1 recreation available is sample-based. Created by Neil Paddock of howtoprogramdrums.com, this sizable set of ready-to-rock ESQ-1 samples comes in both SFZ and Reason ReFill formats. Bedroom Producers Blog have also rolled them into a Kontakt version. It probably goes without saying that any number of ROMplers can better the sound quality of the original ESQ-1, but if you want to impart some of the original '80s Ensoniq character to your own samples, you might give a listen to 112dB's Morgana, a gorgeously crafted recreation of the ESQ-1's stablemate, the also-8-bit Mirage sampler.